Inner Source - the adoption of open source development paradigm within organizations - is becoming very popular. Numerous organizations have experimented with this model, but so far it’s not always clear where to start. To get started, we distilled 9 factors to consider when adopting inner source. Further research is needed to understand the various models of inner source that companies are adopting. What software product would be suitable for inner source? How does development of an inner-source project differ from that of a traditional software project? Why would developers want to start or get involved in an innersource project? This article aims to shed some light on these questions. On the basis of a comprehensive review of the existing research, as well as our hands-on experience in several organizations, we identified nine key factors for organizations to consider when adopting inner source.2 The factors constitute a framework to understand innersource initiatives. To illustrate the factors, we present analyses of inner-source initiatives at Philips Healthcare, Lucent (which later merged with Alcatel), and Philips Research. These cases differ greatly in size, domain, and activity level and provide insightful examples of inner source. We collected the data for these case studies through interviews with key people involved and the initiatives’ supporting documentation. Organizations interested in adopting inner source can use these factors as a lens to gauge where they stand and to guide implementation of their inner-source initiatives. An assessment of these factors can help identify a product suitable for inner source and potential barriers to inner-sourcing success. Several large organizations have adopted inner source over the last decade. An early study described Hewlett-Packard’s experiences5, followed by experience reports from companies including Alcatel- Lucent11, Philips Healthcare, 4 IBM,6 and SAP.7 Each of these companies took its own approach to adopting inner source. early feedback and frequent releases to keep a project alive and quickly improving. This list is by no means exhaustive, but these practices are a common subset in successful OSS projects such as the Linux kernel and Apache webserver. 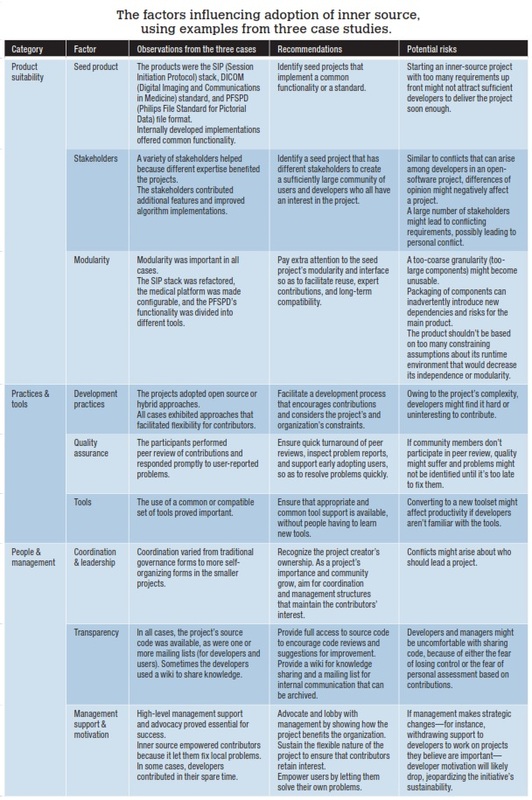 The factors fall into three categories: product suitability, practices and tools, and people and management (see Table 1). The factors in this category are the seed product, its stakeholders, and the product’s modularity. The seed product. The first step toward an inner-source initiative is to select an appropriate seed product— an existing initial implementation of a software product or component. Similarly to projects in open source communities, starting an innersource project from scratch is difficult. Without an initial vision of a project, it’s hard to attract developers from across an organization to invest time and resources. Instead, it’s much more useful to have a seed product that can attract a developer community and grow to a successful inner-source project. This seed project must offer sufficient value to an organization. Starting an innersource project around a new operating system or database management system is unlikely to attract many contributors because building such commodity software is wasteful. Philips Healthcare’s inner-source initiative started with a component suite built around the DICOM (Digital Imaging and Communication in Medicine) standard, which many medical-imaging systems use. Philips Healthcare develops various products in this domain, such as x-ray and MRI (magnetic resonance imaging) scanners. This component suite, which evolved to a platform for Philips’ software product line, had significant business value, so developing it in-house was a logical decision. Philips Research’s initiative involved an implementation of the Philips File Standard for Pictorial Data (PFSPD), a file format for video sequences that had been developed internally. This technology wasn’t commonplace when it emerged in the ’90s, when PCs still had limited capabilities for video processing, which required special hardware. Philips Research used PFSPD for research on video-processing algorithms that could subsequently be implemented in hardware. Over time, hundreds of different algorithms were implemented, all using PFSPD. Philips Healthcare’s software product line platform became an important part of a variety of products developed at the company. Because many stakeholders had an interest in this platform, pooling resources to further develop it made sense. Furthermore, given that the products had widely varying requirements, the platform also benefited from a range of improvements from the various stakeholders. Lucent’s SIP stack implementation also benefited greatly from the company’s inner-source strategy. SIP is a text-based protocol and thus requires a parser to parse SIP messages. The SIP protocol is complex; although the initial implementation worked well, room for improvement existed. Developers from elsewhere in the organization offered such improvements. For instance, one developer with extensive parsing expertise contributed an improved parser implementation. Other contributors also improved parts of the code. PFSPD’s initial version was written by a few developers who identified a need to collaborate with USbased teams. However, those teams didn’t have the necessary specialized and high-cost hardware infrastructure. Therefore, a new version of PFSPD for (at that time) newer platforms running Linux was necessary so that the teams could collaborate closely for research and implementation of video algorithms. Modularity. Modularity is a generally desired feature of software and is particularly important for community- based development. It lets developers focus on learning a subset of the overall code to which they can then meaningfully contribute. It also facilitates parallel development. Different developers can work on different parts of the project at the same time, without any merge conflicts when they check in contributions at the same time. Although an inner-source project should have sufficient functionality to be interesting enough to attract contributors, additions shouldn’t compromise a module’s cohesiveness. If this happens, the module might become too heavy and harder to reuse. For instance, at Philips Healthcare, the initial component suite offered too many combinations. So, Philips architects evolved it into a more integrated and pretested platform that was highly configurable, thus making it easier to use correctly. The PFSPD implementation benefited from a well-designed API early during the project. Additional utility tools (39 in total) were developed around the main library, such as converters, comparison tools, and viewers. Given that these were developed as separate tools, the tool chain exhibited considerable modularity. At some point, the developers found that maintaining and releasing these different tools was a burden and integrated them into a single command-line application while maintaining the original modular architecture. The second category of factors pertains to the development process and tools used in an inner-source project. The degree to which organizations can adopt such flexible approaches will differ widely. Philips Healthcare’s medical devices are subject to strict regulations (such as from the US Food and Drug Administration). It adopted a hybrid approach that let it comply with necessary regulations while gaining the flexibility offered by open source practices. In Philips Healthcare’s codevelopment projects, business units (the “customers”) and the core team (which manages the shared platform) worked together on newly identified features and requirements. Such codevelopment ensured sufficient domain expertise in the implementation and compliance with the platform’s architecture. If a business unit urgently required a certain feature for a product release, it was free to make local changes to the platform. An open source license would require any changes to be contributed back to the project. Inner source doesn’t require this because licensing generally isn’t an issue for internal development—the software is still proprietary, after all. However, it would be highly desirable to give back any changes to the core team. In that way, other business units can benefit from such additions, and the business unit doesn’t have to carry the burden of maintaining its private features. The PFSPD implementation was never an official project but rather an initiative by motivated developers to tend to their needs. Because development was extracurricular, work on PFSPD should be characterized as a series of development “bursts.” When a new feature or improvement shared platform) worked together on newly identified features and requirements. Such codevelopment ensured sufficient domain expertise in the implementation and compliance with the platform’s architecture. If a business unit urgently required a certain feature for a product release, it was free to make local changes to the platform. An open source license would require any changes to be contributed back to the project. Inner source doesn’t require this because licensing generally isn’t an issue for internal development—the software is still proprietary, after all. However, it would be highly desirable to give back any changes to the core team. In that way, other business units can benefit from such additions, and the business unit doesn’t have to carry the burden of maintaining its private features. The PFSPD implementation was never an official project but rather an initiative by motivated developers to tend to their needs. Because development was extracurricular, work on PFSPD should be characterized as a series of development “bursts.” When a new feature or improvement was necessary and time was available, developers worked intensively on the project. Before working on a feature, they usually announced this intention on the mailing list, which sometimes resulted in feedback on the proposed approach. Quality assurance. Open source communities have developed QA practices that set them apart from traditional software development. For instance, peer review of contributions by the developer community effectively obtains feedback on contributions. Peer review isn’t unique to open source development, but the large scale on which this can happen is, as reflected by Linus’s law. Another motto common in open source communities is “release early, release often,” which encourages solicitation of early feedback on new code.3 Time-based, frequent releases also facilitate a stable rhythm of feedback. Such a consistent process eliminates the problem of developers rushing to have their new features included shortly before a new release because they’re unsure when the next release will happen. With a reliable release schedule, developers know that, if a feature doesn’t make it into the next release, they can fit it into the release after that, which will happen in a predictable manner. 14 At Philips Healthcare, making new releases of the platform of several million LOC isn’t trivial, and new versions typically are released twice a year. However, the core team regularly takes snapshots of the latest development version. Some teams use this opportunity for frequent integration to keep the feedback loop as short as possible. These teams found this proactive attitude worked much better than waiting for the regular, less frequent releases, at which point much integration testing would be necessary. In the PFSPD project, a key element of QA was that the developers immediately investigated any problem reports from users. This way, they quickly resolved issues, which also built the users’ confidence in the project’s quality. Philips Healthcare is such a federated organization that has grown over time. It overcame the issue of disparate tools by using a standardized toolset from an external provider that offered a common development environment through a software-as-a-service approach. A local support team in the company helped business units deploy and use these tools—for instance, by providing training. The PFSPD project benefited greatly from the common set of tools that were used early in the project. This proved particularly useful when one core team member moved to offices in the US. Having the infrastructure necessary for distributed development already available, development continued seamlessly. And, because of the new time difference, development could “follow the sun” during development bursts. The third category of factors pertains to the organization and its people, and addresses coordination and leadership, transparency, and management support and motivation. Coordination and leadership. Innersource projects need a more flexible approach to coordination and leadership compared to conventional approaches based on organizational hierarchies and roles. A key tenet of a bazaar-style approach is meritocracy.7 Developers who contribute significantly to certain parts of the code, and thus have deep expertise, can become coordinators, or “trusted lieutenants,” helping the “benevolent dictator” manage and coordinate the project. Coordination in bazaars is based on self-organization,7 in which developers self-select tasks to work on, whether these are code contributions, defect fixes, or bug reports and documentation. Many open source projects typically have no commercial aim (although companies are increasingly involved in developing some successful open source projects)15. Nevertheless, it might be important to formalize a number of roles in the core team that’s managing an innersource project. 16 Which roles are necessary will depend on the organization’s context, and they might emerge as needed. For instance, at Lucent, besides a benevolent dictator, a “community liaison” interacted with the various business units using the inner-source project. The PFSPD core team comprised four key members, but other developers contributed too. The project’s developer community was small, with a slightly bigger community of several tens of users. Transparency. As we mentioned before, inner source is derived from the open source phenomenon, in which development is community based and the process is transparent and generally open to anyone who wishes to be involved. So, transparency is important but might not always be straightforward. Developers and managers might not be comfortable with sharing code and development responsibility.5 However, providing full access to all development artifacts through supporting infrastructure such as a source code repository and a wiki for sharing knowledge is important. Projects should also 5 maintain a mailing list for asynchronous communication and an IRC server for synchronous communication. Without such transparency, developers won’t be able to “lurk” and will have no way to contribute to the project, which will greatly inhibit the inner-source initiative. At Philips Healthcare, all developers could access the source code of the SPL (software product line) platform, stored in a central version control system. Furthermore, development became much more transparent, with a wiki server to facilitate organization-wide knowledge sharing and a mailing list through which developers could communicate and ask questions, much as how developers in open source communities interact. In fact, because the mailing list so successfully provided a Q&A forum, the initial help desk that Philips had set up internally was considered obsolete. Transparency also played a role in the PFSPD project. Initially, access to the source code repository was limited to the core developers. However, PFSPD became an innersource project once the source code was migrated to an internal SourceForge installation. The main communication channels were two mailing lists: a developer list to discuss daily development and progress and a list to support the user community. New releases were downloaded several tens of times. The PFSPD project was, as we mentioned before, never an of cially funded project assigned to a specific team. The project emerged from the researchers’ need to have PFSPD available on commodity hardware. However, because of this collaboration model’s novelty, some contributors had dif culty justifying their time spent on the project because management didn’t fully understand or appreciate their efforts or the nature of the innersource initiative. For others, time spent on this project could be justified as a technology transfer activity. The general appreciation of the project’s users further kindled the developers’ motivation to sustain work on the project. Whether developers get involved in an inner-source project also depends strongly on the corporate culture and norms. Some organizations have a highly traditional culture that emphasizes conformance with rules and guidelines, whereas others have a more liberal culture that encourages taking the initiative. Although we believe the recommendations we described are useful, merely following them won’t necessarily result in a successful inner-source initiative. Other factors that can affect such a program’s success might be at play, and more research is needed to better understand what makes or breaks an inner-source initiative. Furthermore, defining what makes such an initiative successful depends on the context. In the three cases we presented, inner source offered mechanisms that empowered developers. For instance, business units at Philips Healthcare were empowered by their ability to make local changes to the shared platform shortly before a release. Lucent developers were empowered to improve the code, and researchers at Philips Research could collaborate on their video algorithm research. We’re grateful to all informants of our studies for their time and enthusiasm. We thank Bram Siemens, Robert Jan Schutten, en Kees van Zon for sharing their insights into the PFSPD (Philips File Standard for Pictorial Data) project. This research is supported, in part, by Enterprise Ireland grant IR/2013/0021 to ITEA2 SCALARE (Scaling Software), Science Foundation Ireland grant 13/RC/2094 to Lero—The Irish Software Research Centre, and the Irish Research Council under the New Foundations program. C. Ayala et al., “Five Facts on the Adoption of Open Source Software,” IEEE Software, vol. 28, no. 2, 2011, pp. 95–99; doi:10.1109/MS.2011.32. K.J. Stol et al., “Key Factors for Adopting Inner Source,” ACM Trans. Software Eng. and Methodology, vol. 23, no. 2, 2014, article 18; doi:10.1145/2533685. E.S. Raymond, The Cathedral and the Bazaar, O’Reilly, 2001. J. Wesselius, “The Bazaar inside the Cathedral: Business Models for Internal Markets,” IEEE Software, vol. 25, no. 3, 2008, pp. 60–66; doi:10.1109/MS.2008.79. J. Dinkelacker et al., “Progressive Open Source,” Proc. 24th Int’l Conf. Software Eng. (ICSE 02), 2002, pp. 177–184; doi: 10.1145/581339.581363. P. Vitharana, J. King, and H.S. Chapman, “Impact of Internal Open Source Development on Reuse: Participatory Reuse in Ac tion,” J. Management Information Sys tems, vol. 27, no. 2, 2010, pp. 277–304; doi:10.2753/MIS0742-1222270209. D. Riehle et al., “Open Collaboration within Corporations Using Software Forges,” IEEE Software, vol. 26, no. 2, 2009, pp. 52–58; doi:10.1109/MS.2009.44. P. Copeland and A. Savoia, “Entrepreneurial Innovation at Google,” Computer, vol. 44, no. 4, 2011, pp. 56–61; doi:10.1109 /MC.2011.62. L. Morgan, J. Feller, and P. Finnegan, “Exploring Inner Source as a Form of Intra-organisational Open Innovation,” Proc. 19th European Conf. Information Systems, 2011, paper 151; http://aisel .aisnet.org/ecis2011/151. F. van der Linden, “Applying Open Source Software Principles in Product Lines,” Upgrade, vol. 10, no. 3, 2009, pp. 32–41. V.K. Gurbani, A. Garvert, and J.D. Herbsleb, “A Case Study of a Corporate Open Source Development Model ,” Proc. 28th Int’l Conf. Software Eng. (ICSE 06), 2006, pp. 472–481; doi:10.1145/1134285.1134352. B. Fitzgerald et al., “Scaling Agile Methods to Regulated Environments: An Industry Case Study,” Proc. 35th Int’l Conf. Software Eng. (ICSE 13), 2013, pp. 863–872; doi:10.1109/ ICSE.2013.6606635. W. Scacchi, “Free and Open Source Development Practices in the Game Communit y,” IEEE Software, vol. 21, no. 1, 2004, pp. 59–66; doi:10.1109/MS.2004 .1259221. M. Michlmayr, B. Fitzgerald, and K.J. Stol, “Why and How Should Open Source Projects Adopt Time-Based Releases?,” IEEE Software, vol. 32, no. 2, 2015, pp. 55–63; doi:10.1109/MS.2015.34. J.M. Gonzalez-Barahona et al., “Understanding How Companies Interact with Free Software Communities,” IEEE Software, vol. 30, no. 5, 2013, pp. 38–45; doi:10.1109/MS.2013.95. V.K. Gurbani, A. Garvert, and J.D. Herbsleb, “Managing a Corporate Open Source Software Asset,” Comm. ACM, vol. 53, no. 2, 2010, pp. 155–159; doi:10.1145/1646353.1646392. Klaas-Jan Stol is a research fellow at Lero—The Irish Software Research Centre. His research interests include open source software, inner source, and agile and lean methods. Stol received a PhD in software engineering from the University of Limerick. Contact him at klaas-jan.stol@lero.ie. Brian Fitzgerald is chief scientist at Lero—The Irish Software Research Centre and holds the Frederick Krehbiel Chair in Innovation in Business and Technology at the University of Limerick. His research interests include open source software, inner source, crowdsourcing, and lean and agile methods. Fitzgerald received a PhD in computer science from the University of London. Contact him at bf@lero.ie. What can I say, a great article, very useful, especially me. I personally work in a company that specializes in open source software www.cleveroad.com/blog/check-out-the-benefits-o.... We ourselves, in principle, develop programs for business both for the use of intra-company for its processes, and for commercial use for end users. If you do not mind I'll take a couple of quotes from here for your article, with back links to you.